Based in Augsburg, the German brothers Bartolomäus and Abraham Seuter were Hausmalerei or ‘house painters’, who purchased undecorated porcelain to paint in their workshop and sell on. Initially they decorated tin-glazed ceramics ‘in the white’ from the Bayreuth and Nuremberg manufactories, but by 1729 their workshops were painting onto porcelain produced at the Meissen factory using gold, silver and polychrome enamels. Their workshop specialised in painting figurative, fanciful interpretations of the East known as chinoiserie, which were commonly drawn from contemporary engravings in travel books on Asia. This teapot is decorated with a chinoiserie scene depicting figures under a canopy, an angler, a flying dragon, birds and plants. 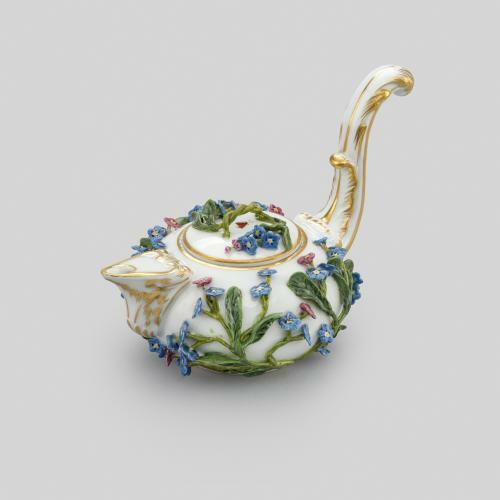 The oblong shape of the pot was one of Meissen’s earliest teapot models. Named the ‘ostrich-egg’ in the factory’s inventories, it was introduced between 1710-1713 for the production of Böttger red stoneware teapots. This particular model with low-relief moulded decoration is particularly rare and was first described in the archives of 1719 (Boltz 2000 pp.115-130). This teapot once formed part of the Sir Bernard Eckstein Collection, an important art collection auctioned at Sotheby’s after the war in 1949. Sir Bernard (1894-1948) was the second Baronet of Fairwarp, East Sussex. The Eckstein Baronetcy was created on the 24th of April 1929 for Frederick Eckstein, a German-born South African goldmine developer. Along with the sale of his collected works at Sotheby’s, Sir Bernard donated large parts of his collection to the British Museum and the V&A.